"Fucoidan reduces the toxicities of chemotherapy for patients with unresectable advanced or recurrent colorectal cancer." Fucoidan reduces the toxicities of chemotherapy for patients with unresectable advanced or recurrent colorectal cancer. Department of Surgery, Division of Surgical Oncology, Faculty of Medicine, Tottori University, Yonago 683-8504. Combination chemotherapy with oxaliplatin plus 5-fluorouracil/leucovorin (FOLFOX) or irinotecan plus 5-fluorouracil/leucovorin (FOLFIRI) has become a standard regimen for advanced or recurrent colorectal cancer. Numerous studies have reported that long-term use of FOLFOX or FOLFIRI leads to better survival for these patients. Thus, control of the toxicity of these drugs may be crucial to prolonging survival. Fucoidan is one of the major sulfated polysaccharides of brown seaweeds and exhibits a wide range of biological activities. In the present study, we analyzed the effect of fucoidan on suppressing the toxicity of anti-cancer drugs. A total of 20 patients with unresectable advanced or recurrent colorectal cancer scheduled to undergo treatment with FOLFOX or FOLFIRI were randomly allocated into a fucoidan treatment group (n=10) and a control group without fucoidan treatment (n=10). Results showed that fucoidan regulated the occurrence of fatigue during chemotherapy. Chemotherapy with fucoidan was continued for a longer period than chemotherapy without fucoidan. Additionally, the survival of patients with fucoidan treatment was longer than that of patients without fucoidan, although the difference was not significant. Thus, fucoidan may enable the continuous administration of chemotherapeutic drugs for patients with unresectable advanced or recurrent colorectal cancer, and as a result, the prognosis of such patients is prolonged. Efficacy of Low-Molecular-Weight Fucoidan as a Supplemental Therapy in Metastatic Colorectal Cancer Patients: A Double-Blind Randomized Controlled Trial. 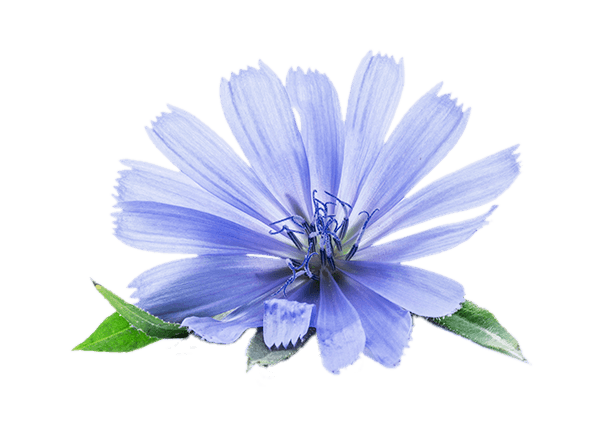 BACKGROUND: Low-molecular-weight fucoidan (LMF) is widely used as a food supplement for cancer patients. However, all of the studies are in vitro or were conducted using mice. Therefore, powerful clinical evidence for LMF use is relatively weak. This study aimed to evaluate the efficacy of LMF as a supplemental therapy to chemo-target agents in metastatic colorectal cancer (mCRC) patients. METHODS: We conducted a prospective, randomized, double-blind, controlled trial to evaluate the efficacy of LMF as a supplemental therapy to chemotarget agents in patients with metastatic colorectal cancer (mCRC). Sixty eligible patients with mCRC were included. Finally, 54 patients were enrolled, of whom 28 were included in the study group and 26 in the control group. The primary endpoint was the disease control rate (DCR), and secondary endpoints included the overall response rate (ORR), progression-free survival (PFS), overall survival (OS), adverse effects (AEs), and quality of life (QOL). RESULTS: The DCRs were 92.8% and 69.2% in the study and control groups, respectively (p = 0.026), in a median follow-up period of 11.5 months. The OS, PFS, ORR, AEs, and QOL did not significantly differ between the two groups. CONCLUSION: This is the first clinical trial evaluating the efficacy of LMF as a supplemental therapy in the management of patients with mCRC. The results indicate that LMF combined with chemotarget agents significantly improved the DCR. Early use of fucoidan in diabetic individuals may minimize damage to testicular tissue. Effects of fucoidan on diabetic rat testicular tissue. Increased reactive oxygen species (ROS) resulting from hyperglycemia and inadequate endogenous antioxidant systems are responsible for the complications of diabetes. ROS accumulate in the cell and stimulate apoptosis, which compromises sperm quality and function. We investigated the possible effects of fucoidan, a potent antioxidant with a regulatory effect on blood glucose homeostasis, on the testicular tissues of rats with experimental diabetes. Diabetes was induced by administering 40 mg/kg streptozotocin (STZ) on five consecutive days. Twenty-four Wistar albino male rats were divided into four groups: group 1, control group (CG); group 2, diabetes group (DG); group 3, early fucoidan group (EFG) treated with 50 mg/kg fucoidan after diabetes induction; group 4, late fucoidan group (LFG) treated with the same dose of fucoidan 15 days after diabetes induction. Fucoidan was administered intraperitoneally every two days for four weeks. Basement membrane thickness and Johnsen scores were higher in the DG than in the CG; no difference was found for either the EFG or LFG compared to the CG. Seminiferous tubule diameters of EFG were significantly greater than for the DG. Apoptotic tubule and apoptotic cell indexes were significantly greater in the DG and significantly less in the EFG and LFG groups compared to the CG. Early use of fucoidan in diabetic individuals may minimize damage to testicular tissue. Fucoidan could be a potential medical adjunctive therapy for small abdominal aortic aneurysm. Fucoidan attenuates angiotensin II-induced abdominal aortic aneurysms through the inhibition of c-Jun N-terminal kinase and nuclear factorκB activation. BACKGROUND: Rupture of abdominal aortic aneurysm (AAA) is one of the leading causes of sudden death among the elderly. Most incidental AAAs are below the threshold for intervention at the time of detection; however, there is no evidence that commonly used cardiovascular drugs have clinical beneficial effects on AAA progression. Therefore, in addition to current cardiovascular risk-reducing treatments, an adjunctive medical therapy targeting the regulation of extracellular matrix metabolism is still required in the clinical setting. Fucoidan is an extract of brown seaweed and a sulfated polysaccharide. Emerging evidence suggests that fucoidan has potential cardiovascular applications. Numerous investigations of fucoidan in diseases of the cardiovascular system have mainly focused on its pleiotropic anti-inflammatory effects. Specifically, fucoidan has been shown to have matrix metalloproteinase (MMP)-reducing effects in several studies. We aimed to evaluate the beneficial effect of fucoidan on aneurysmal growth in a murine model of aortic aneurysm and further provide a rationale for using fucoidan as a medical adjunctive therapy. METHODS: A murine model of angiotensin II (Ang II)-induced AAA was used to assess the therapeutic effects of fucoidan on AAA growth in vivo. The characteristics and quantification of AAAs were determined in situ. Human umbilical vein endothelial cells were used for studying the involved pathways in vitro. Western blotting was used to detect the involved signaling pathways both in vivo and in vitro. RESULTS: Treatment with fucoidan significantly reduced the incidence of AAA formation. Administration of fucoidan significantly attenuated Ang II-induced aortic expansion from 1.56 ± 0.76 mm to 1.09 ± 0.30 mm. Administration of fucoidan significantly suppressed MMP-2 and MMP-9 activities and reduced the grade of elastin degradation in vivo. In vitro, we found that fucoidan could ameliorate the Ang II-induced phosphorylation of c-Jun N-terminal kinase and nuclear factor κB p65, and it further reduced MMP and reactive oxygen species production. CONCLUSIONS: Fucoidan inhibits the progression of experimental AAA growth through the attenuation of proinflammatory nuclear factorκB and c-Jun N-terminal kinase activation. Fucoidan could be a potential medical adjunctive therapy for small AAAs. Effects of fucoidan on insulin stimulation and pancreatic protection via the cAMP signaling pathway in vivo and in vitro. Diabetes is a global disease, in which pancreatic dysfunction is an important pathological process. In previous years, interest in the biological activities of seaweed has increased. Fucoidan is an extract of the seaweed Fucus vesiculosus, which has been widely investigated. The present study aimed to determine the effects of fucoidan on insulin stimulation and pancreatic protection in vivo and in vitro. Goto‑Kakizaki (GK) rats were provided with free access to standard food, with or without fucoidan, for 13 weeks,following which the body weights, and blood glucose and serum insulin levels of the rats were measured. Wistar rats were used as a control. In addition, the RIN‑5F rat insulin‑secreting cell line was treated with fucoidan in high glucose conditions, following which the dose‑dependent and time‑dependent effects of fucoidan were determined, and the concentration of insulin was measured. Glybenclamide was used as a positive control. In vivo, the body weight and serum insulin levels decreased, whereas blood glucose levels increased significantly in the GK rats, compared with the Wistar control rats. Although, fucoidan did not improve changes in body weight, the increased blood glucose levels were reduced and the decreased serum insulin levels were increased in the GK rats following oral administration of fucoidan. In vitro, fucoidan did not exhibit significant cytotoxicity towardsthe RIN‑5F cells, and the insulin secretion increased significantly in a dose‑ and time‑dependent manner. Treatment with amylin, an islet amyloid polypeptide and glybenclamide inhibitor, did not inhibit the stimulatory activity of fucoidan. The results of the present study also demonstrated that the concentration of cyclic adenosine monophosphate (cAMP) was significantly increased in the fucoidan‑treated RIN‑5F cells, and this increase was dose‑ and time‑dependent. In addition, treatment with a phosphodiesterase inhibitor, which decreases the degradation of cAMP, significantly increased fucoidan‑induced insulin secretion, whereas treatment with an adenylyl cyclase inhibitor, which decreases the generation of cAMP, significantly decreased fucoidan‑induced insulin secretion. In conclusion, these data indicated that fucoidan may stimulate insulin secretion and provide pancreatic protection via the cAMP signaling pathway, in vivo and in vitro. There are 4689 on SeaWeed. 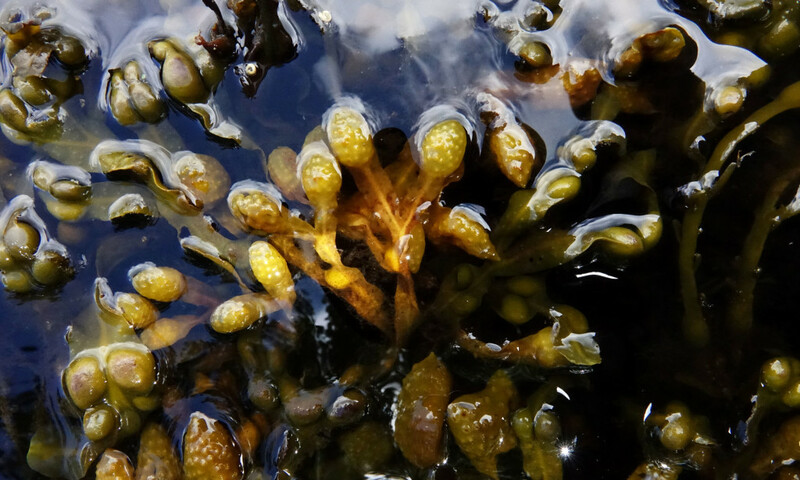 There are 808 on Fucus vesiculosus. There are 1619 on Fucoidan. Seaweeds are divided into three main groupings based largely on their pigmentation. 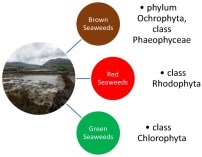 The groupings are brown seaweeds, the red seaweeds and the green seaweeds.